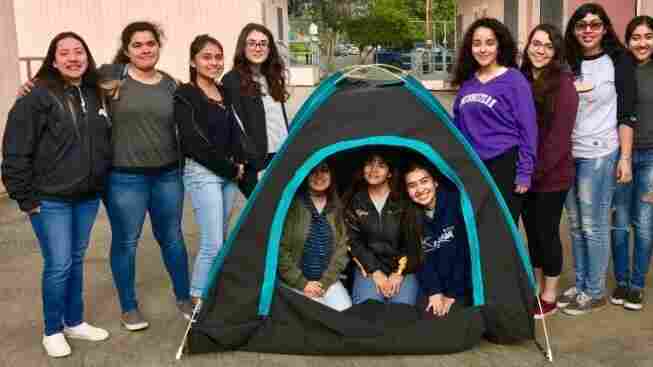 All-Girls Teen Engineering Team Creates A Solar-Powered Tent For Homeless People : All Tech Considered Twelve high school girls coded, soldered and sewed a tent that uses solar power to charge electronic devices, provide light and sanitize itself. The team recently presented their creation at MIT. 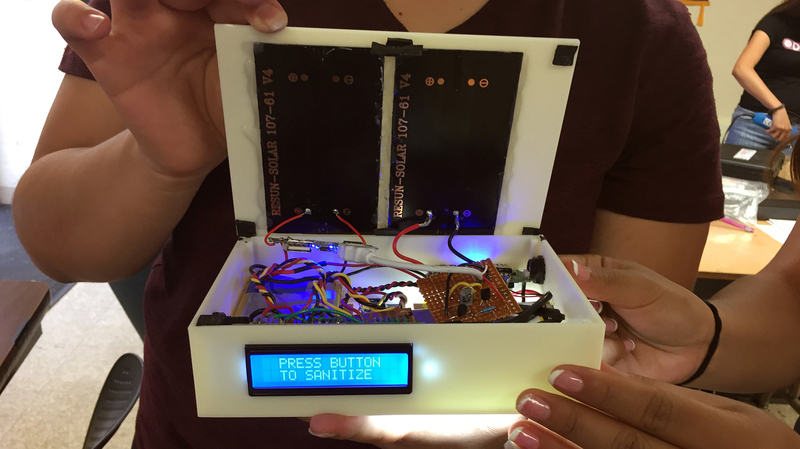 A DIYgirls team from San Fernando Senior High School created a device that uses solar power to sanitize a tent using antibacterial UV lights. An all-girls science club from San Fernando Senior High School near Los Angeles has designed a solar-powered tent meant to help homeless and displaced people around the world. The tent — designed by a group of 12 high schoolers with the help of an organization called DIYgirls — uses solar power to charge electronic devices, provide light and sanitize itself via a system of antibacterial UV lights. And it folds into a backpack for easy travel. The DIYgirls team with their solar-powered tent. The electronics cost about $40. The tent itself is made out of highly durable and water-resistant material. The idea for the tent came after some members of the team saw increased homelessness in their neighborhood. "These girls saw a problem in their community," Evelyn Gomez, an engineer and the executive director of DIYgirls, tells NPR's Morning Edition. The group aims to get young girls from under-resourced areas interested in the fields of science, technology, engineering, art and math. "If we have more young women and more people of color and more people from low-income communities that are able to identify a problem within our communities, then we're going to be better equipped to solve those problems because we've lived through them," Gomez says. She hopes that by working with girls from diverse backgrounds they can bring new perspectives to math and science fields — and that's exactly what these DIYgirls did. Gomez, along with Violet Mardirosian, one of their teachers, helped the girls sew, solder and code their invention into reality. They also received a $10,000 grant from MIT, which gave them the opportunity to present their invention at EurekaFest, a convention put on each year at MIT that showcases the work of young inventors. Next, DIYgirls is hoping to find a partner who could help them mass produce and distribute the solar components of their work, which could be easily attached to almost any tent. Gomez hopes the invention could be useful to help displaced people around the world. "I love to tell the girls that engineering is not only about math and it's not only about science and numbers. ... It's about identifying a problem and helping people," she says. Tyler Hill is a Morning Edition intern.